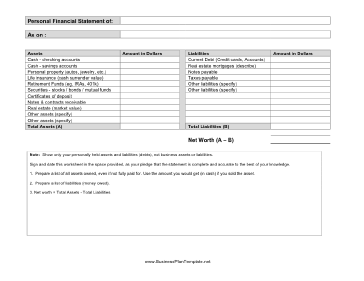 This Personal Financial Statement helps you to collect information relating to your personal financial condition. Note: Show only your personally held assets and liabilities (debts), not business assets or liabilities. Sign and date this worksheet in the space provided, as your pledge that the statement is complete and accurate to the best of your knowledge. Prepare a list of all assets owned, even if not fully paid for. Use the amount you would get (in cash) if you sold the asset. Prepare a list of liabilities (money owed).